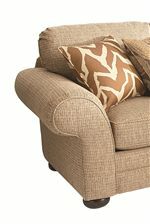 Elegant group seating the whole family will enjoy, this 3 pc. sleeper sectional features panel rolled arms and turned wood legs. 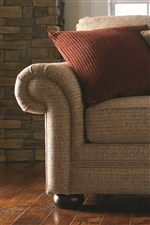 In addition, optional nailhead trim lines the base and each arm for a classic, sophisticated touch. Where comfort is also key, coil flex suspension combined with plush, boxed edge seat cushions creates a soft and supportive seat for as many as 7 people. Fit with a pull-out bed frame and mattress on each side, this sectional provides comfort at all hours of the day and night. 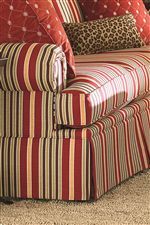 The Custom Upholstery - Manor Customizable 3 pc. Sleeper Sectional with Nailhead Trim, Panel Arms and Turned Feet by Bassett at AHFA in the area. Product availability may vary. Contact us for the most current availability on this product. 5000-6YF Customizable LAF Sleeper w/o Corner 1 81" 38" 38"
5000-6XF Customizable RAF Sleeper w/o Corner 1 81" 38" 38"